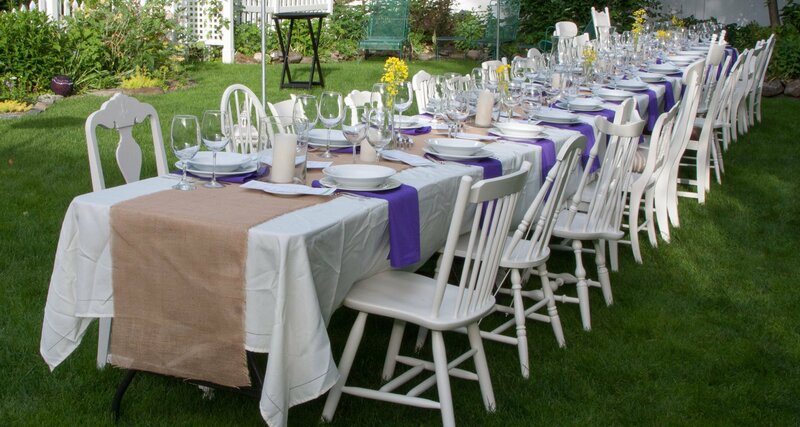 In 2014 the Phineas Swann began its summer Farm To Table Dinners. This year we offer four opportunities to dine outdoors on a warm Saturday evening and enjoy the best local produce Vermont has to offer. Served family style, all of the items on our farm to table dinner menu are locally grown and produced, and cooked in our own kitchen before being served in our scenic gardens. Reservations are required for the dinners, which begin at 7 p.m. and includes a five-course meal including aperitif, appetizers, salad, entree with two sides and dessert, as well as a glass of distinctive Vermont wines all for just $49 per person. Call (802) 326-4306 to reserve your seat. But do so quickly — with only 35 seats, the dinners always sell out. The Phineas Swann Bed & Breakfast Inn is the only Vermont Fresh Network restaurant in Montgomery, and is proud to use VPN members and other local providers for all its meals, including farm-fresh eggs, cobb-smoked bacon, mountain-picked blueberries and breads baked on premises.